The irradiation with UV light for disinfection has long been known and tested. The use for oxidative degradation of VOCs and odors in the air, however, has only reached the point of application in recent years. In addition to the requirements of temperature management and the potential sensitivity of UV lamps to deposit formation such as moisture, the low power yields and the complex energy supply had to be overcome as significant technical hurdles. The development of specially adapted low-pressure and high-performance medium-pressure lamps for application-specific generation of VUV and UVC radiation plays an important role here. The newly developed technology based on the principles of the new photooxiation is also able to handle complex air purification tasks to reduce odor and VOC emissions. Through clever combination of process steps, wide concentration ranges, constant or fluctuating, with contaminants or not, can be reliably treated. Unpleasant odors arise in many processes in industry as well as in public life. The treated substance concentration in the untreated air is usually between 5 to 100 mg/m³. The diffuse emissions as well as the confined indoor air flows in composting plants and waste treatment plants are systemically the cause of unpleasant odors and are often found near residential areas. Limonen, butyric acid (biting, sweat), acetic acid (biting, vinegar) and other. Carboxylic acids must be oxidized here. 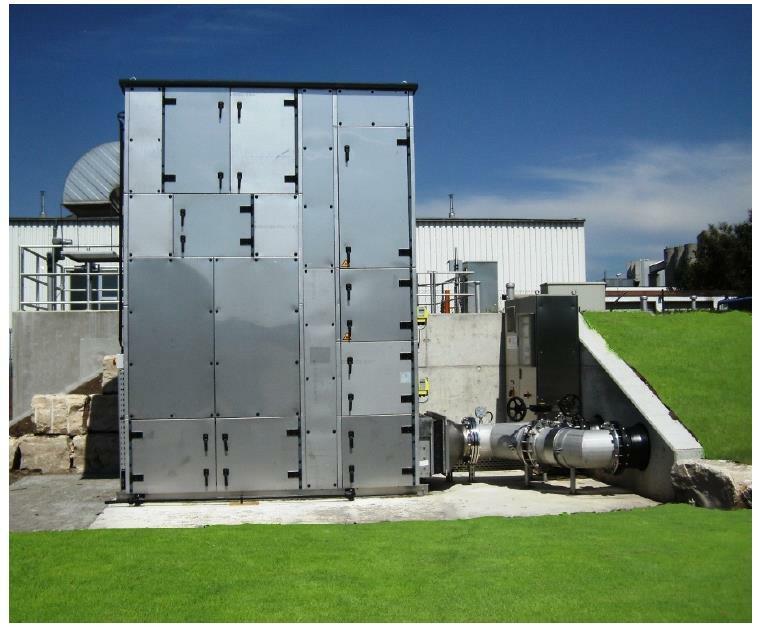 Sewage treatment plants produce odor-intensive emissions through open settling tanks or sewage sludge treatment plants, which can lead to an odor nuisance to the residents (Fig. 1). Mostly hydrogen sulphide (rotten eggs), mercaptans, sulphides and other sulphurous hydrocarbons, ammonia (biting, urine) and skatole (feces) are the causes. Landfills are also responsible for this type of odor. In animal feed production and livestock production and utilization are still typical odors such as amines (fish), cadaverine and putrescine (decay) and other nitrogen-containing hydrocarbons added. Hardeners release amines. In the rubber industry acrolein and styrene (burning smell) are to be reduced. But also supposedly pleasant odors lead to permanent exposure and high concentrations to harassment. In food production, restaurants / canteen kitchens are processed roasting, edible oils, spices, terpenes and terpenoids (perfumes) and other fragrances in the life science industry. Aromatic hydrocarbons (benzene, toluene, xylene), aliphatic hydrocarbons (hexane, ethylene, butadiene) and other oxygen-containing hydrocarbons (alcohols, ethers, aldehydes, ketones, esters, phenols) have to be considered in the chemical industry and many other industries (Fig 2). Odor elimination by UV photooxidation reliably reduces or even completely eliminates such odorous substances. The substances are oxidized so far until they are odor-inactive to complete oxidation. The result is odorless inconspicuous exhaust air, which can be readily released into the environment. Thus, this technique is increasingly being used in the aforementioned fields of application. In addition to volume flow, pollutant concentration and composition, decisive factors such as emission characteristics, explosion protection, moisture, aerosols / dusts, oxidizable interfering components and energy concepts can have a decisive influence on the design and dimensioning. With knowledge of these relationships, appropriate measures can be planned. Here similar conditions apply as for the odor elimination. The main differences are that, instead of partial degradation, complete oxidation to CO2 and H2O is always the cleaning task. Also, the concentration ranges here are usually higher at 50 - 10,000 mg / m³. Production companies that use solvents in the production of coating systems, drying systems, coating machines, etc. and operate ventilation systems emit VOCs. Depending on the type and amount of emissions, different process combinations (DF, RF) are used. The process according to the principles of the new photooxiation is widely used successfully in industries for the production and processing of foodstuffs and cosmetics, paints and varnishes, chemicals, pharmaceuticals, metal and automobiles, wood and paper (Figure 2), contaminated sites, industrial wastewater, compost, recyclables and garbage. A Japanese paper company operates a plant for recycling paper and plastic waste (Fig. 2). During the compression and pelleting process, the transfer of the informal waste into pellets, considerable temperature increases, as a result of which large amounts of water vapor and pollutants from the material in the cooling air flow of 6,000 m³/h pass. The VOCs here are formaldehyde (40-50 ppm), ammonia (100 ppm), amines (50-80 ppm) and styrene (50 ppm). 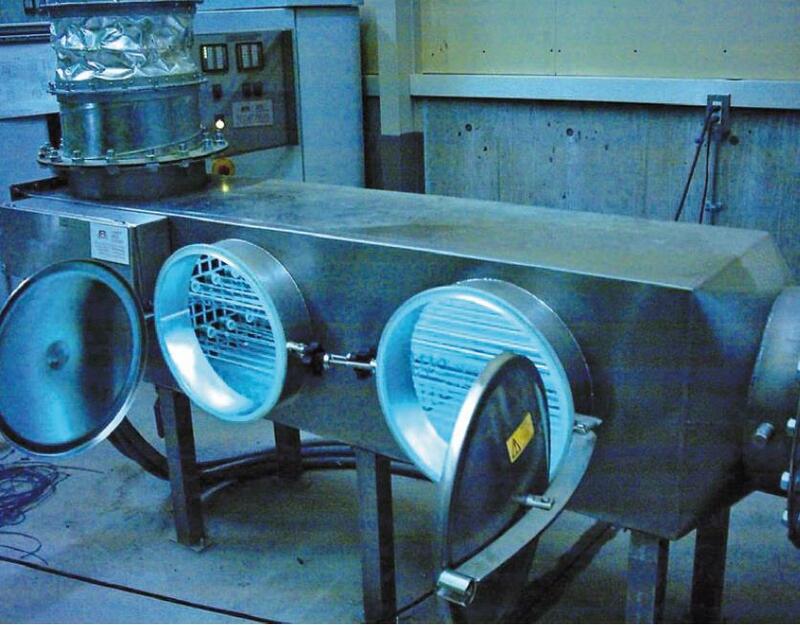 For pollutant and odor elimination of the resulting air flow, an exhaust air purification system was installed according to the DF principle, which included a photooxidation stage in addition to an effective aerosol / condensate and dust separation. The requirement for cleaning was not limited to pollutant reduction, but included the elimination of odors. Thanks to the procedural integration into the existing system technology, as well as a low expenditure on personnel and operating costs, with a power of 4.5 kW the pollutant reduction could be reduced to less than 50 ppm and the resulting odors eliminated. A manufacturer of chemical raw materials from coal tar, Petroteer and other raw materials operates a biological wastewater treatment plant, from which polluted air flows are derived. As part of the reduction of emissions according to the VOC directive, the company is obliged to operate an exhaust air purification system. The already approved and installed biofilter plant was not up to the cleaning task and had to be replaced. In particular, the fluctuating levels of BTEX aromatics and alkylbenzenes (50-700 mgC/m³) were not reliably retained and degraded. After dismantling a photo oxidation plant was built according to the RF-AF principle. The moist exhaust air flow of approx. 14,000 m³/h is first freed of entrained particles by means of a mist eliminator and aerosol / dust filter. A pre-filter stage with iodine-impregnated air-activated carbon precipitates non-excludable low concentrations of H2S by means of chemisorption. The organic pollutant concentration courses are fluctuating and at a low level. The pretreated VOC-loaded main stream of 14,000 m³/h is alternately passed through two of three parallel adsorption stages. Here, the fluctuating NMVOC loads (non-methane volatile organic compounds) are completely separated to below 50 mgC/m³ (without methane) by adsorption by means of a suitable adsorbent. The escaping exhaust air permanently meets the required clean air limit values. Even before exhaustion of the adsorbent is switched to the third parallel fresh adsorption. This is ensured by an online measurement at the system output, which outputs a signal when a certain measured value is reached. 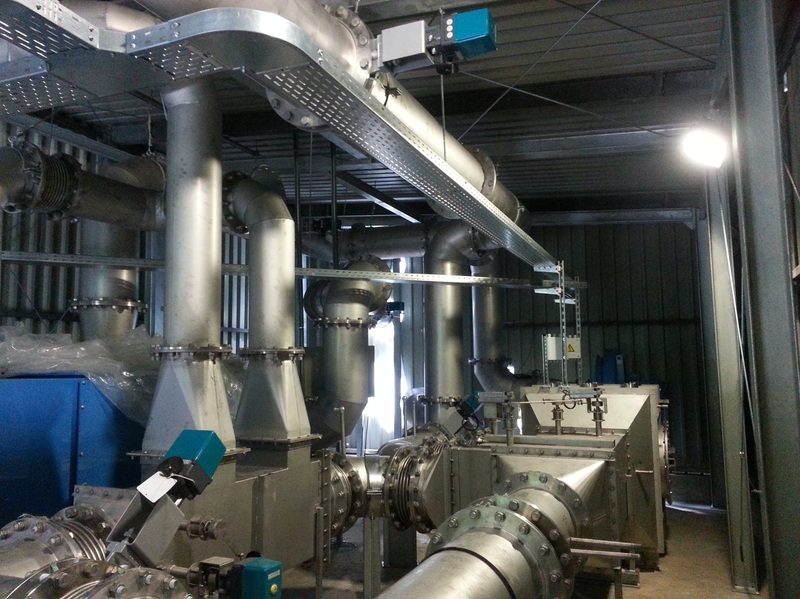 The first stage goes into a UV operating phase in the regeneration cycle. This circuit is operated in countercurrent by means of a fan. The circulating air is passed through a UV stage and then over a catalyst stage before it returns to the adsorption stage. Due to the energy input of the UV radiation, the circulation air heats up to operating temperatures that are required for the desorption and regeneration of the adsorbent and for the operation of the catalyst stage. At certain medium temperatures, the previously adsorbed organic pollutants are expelled again quickly and uniformly from the adsorption under defined conditions and supplied with the circulating exhaust stream of UV photo-oxidation with downstream catalysis. Here they are then mined to complete mineralization (CO2, H2O). The adsorption step is cooled down and then regenerated ready for adsorption. Compared to the direct photo-oxidation can be achieved by the proposed procedure enormous savings in resources such as electricity, lamps and catalyst. In addition to increased effectiveness, the value-intensive components such as UV lamps and the catalyst material used are largely protected against deposit formation, poisoning and blocking by aerosols, dusts and other aggressive ingredients in the main stream. The reliable control of the air inlet temperature at the adsorber is ensured by means of an air-to-air heat exchanger and lamp control. The recovered energy is available in the form of hot air during regeneration. A pharmaceutical company in Switzerland manufactures finished medicinal products and specializes in the development and manufacture of solid dosage forms, including primary and secondary packaging, including the manufacture and packaging of clinical trial samples. In pharmaceutical granulation / fluidized-bed drying, solvents are sprayed on and thus get into the environment with the exhaust air. Here, emissions of VOC (volatile organic compounds) are generated to a considerable extent. The main components are currently ethanol, in the future also through a production expansion of acetone and isopropanol with a pollutant concentration of up to 7,000 mgC/Nm³ and a volume flow of up to 18,000 Nm³/h. An installation according to the DF principle with downstream catalysis was erected, optimized and approved in accordance with the regulatory requirements in roof installations. An enterprise of the armaments industry represents u.a. Granathülsen ago. In the processes of painting and impregnation, xylenes, acetates and alcohols are predominantly into the exhaust air. A 20-year-old TNV was dismantled and replaced by a photo-oxidation plant with a combination of DF and RF-AR with higher flow rates (Fig. 3). Here the plant was completely integrated into the existing plant hall. Now up to 6,000 m³/h of exhaust air with various concentrations (0 to 11,000 mg/m³) from different emission points can be cleaned simultaneously. 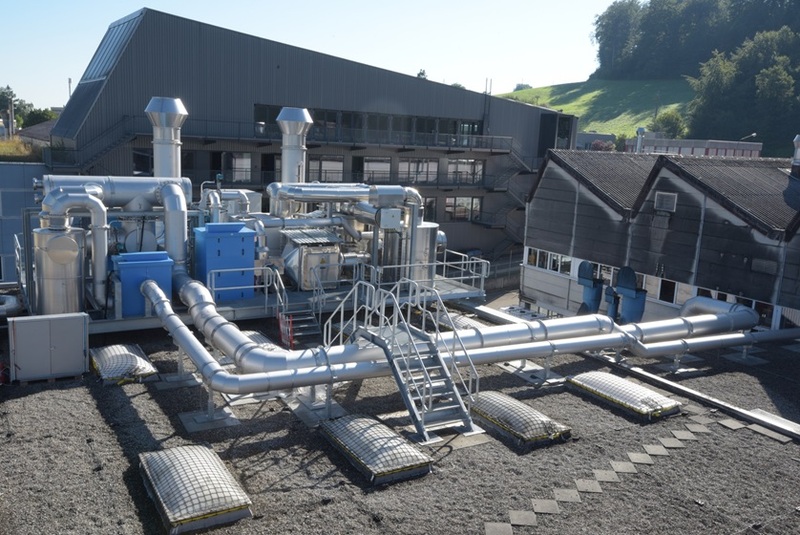 A printing ink manufacturer in Switzerland collects the room air from various areas of the plant and, together with exhaust air streams from the unit cleaning (about 20,000 m³/h), uses a photo-oxidation plant in accordance with the RF-AR principle (Fig. 4). The VOCs are composed of alcohols, acetates and ketones and vary between 150 and 500 mg/m³. The high emission peaks from the package cleaning are previously passed through a smoothing stage. The system was completely realized in roof installation. The various application examples show performance and adaptability of the new photooxidation. The technology of photo-oxidation is space-saving, flexible and easy to control, modular and cost-saving. The treatment is CO2-emission-neutral. Photooxidation is one of the low-temperature plasma processes and is described in the new VDI Guideline 2441 as a guide for planners and users.